• Cell damage or cell death-resulting in massive K+ release. Excretion of potassium is increased by aldosterone, which stimulates K+ and H+ secretion in exchange for Na” in the collecting duct. Because H+ and K+ are interchangeable in the exchange mechanism, acidosis decreases and alkalosis increases the secretion of K+. Aldosterone secretion is stimulated by hyperkalaemia and increased angiotensin II levels, as well as by some drugs, and acts to protect the body against hyperkalaemia and against extracellular volume depletion. The body adapts to dietary deficiency of potassium by reducing aldosterone secretion. However, because aldosterone is also influenced by volume status, conservation of potassium is relatively inefficient, and significant potassium depletion may therefore result from prolonged dietary deficiency. 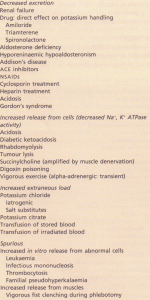 A number of drugs affect K+ homeostasis by affecting aldosterone release (e.g. heparin, NSAIDs) or by directly affecting renal potassium handling. Normally only about 10% of daily potassium intake is excreted in the gastrointestinal tract. Vomit contains around 5-10 mmol litre-‘ K+, but prolonged vomiting may cause hypokalaemia by inducing sodium depletion, stimulating aldosterone, which increases renal potassium excretion. Potassium may be secreted by the colon, and diarrhoea contains 10-50 mrnol litre-‘ K+; profuse diarrhoea can therefore induce marked hypokalaemia. Villous adenomas may rarely produce profuse diarrhoea and K+ loss. 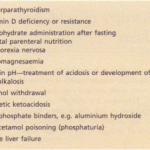 The commonest causes of chronic hypokalaemia are diuretic treatment (particularly thiazides) and hyper aldosteronism. Acute hypokalaemia is more often caused by redistribution into cells. The common causes are shown. 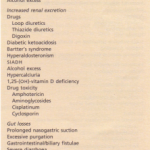 diuretic abuse. Excess production of renal prostaglandins is often found. Magnesium wasting may also occur. LIDDLE’S SYNDROME is also characterized by potassium wasting, hypokalaemia, and alkalosis, but is associated with low aldosterone production and high blood pressure. HYPOKALAEMIC PERIODIC PARALYSIS may be precipitated by carbohydrate intake, suggesting that insulinmediated potassium influx into cells may be responsible. This syndrome also occurs in association with hyperthyroidism in Chinese patients. Hypokalaemia is usually asymptomatic, but severe hypokalaemia may cause muscle weakness. Potassium depletion may also cause symptomatic hyponatraemia. 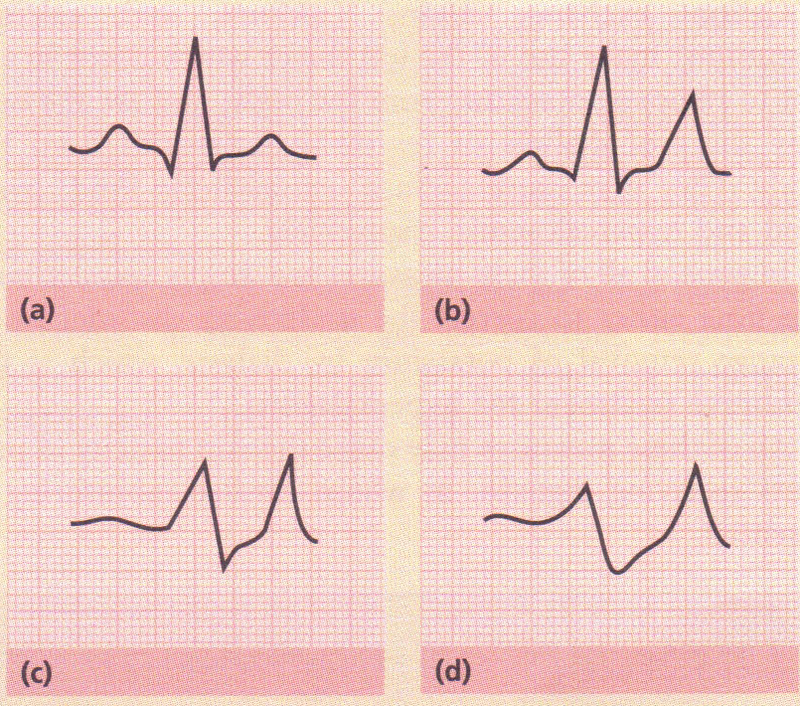 Hypokalaemia is associated with an increased frequency of atrial and ventricular ectopic beats. 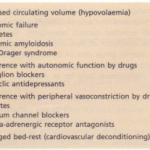 This association may not always be causal, because adrenergic activation (for instance after myocardial infarction) causes both hypokalaemia and increased cardiac irritability. 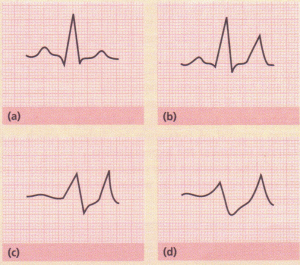 Hypokalaemia in patients without cardiac disease is unlikely to lead to serious arrhythmias. Hypokalaemia seriously increases the risk of digoxin toxicity by increasing binding of digoxin to cardiac cells, potentiating its action, and decreasing its clearance. The same may be true of some other drugs which cause arrhythmias. Chronic hypokalaemia is associated with interstitial renal disease, but the pathogenesis is not completely understood. The underlying cause should be identified and treated where possible; for examples. Acute hypokalaemia may correct spontaneously. In most cases, withdrawal of oral diuretics or purgation, accompanied by the oral administration of potassium supplements in the form of slow-releasing potassium or effervescent potassium, is all that is required. Intravenous potassium replacement is only required in conditions such as cardiac arrhythmias, muscle wealcness or severe diabetic ketoacidosis when the potassium is <2.5 mmol litre “. When used, intravenous therapy must take account of renal function and replacement at rates >20 mmol hour” should only be used with hourly monitoring of serum potassium and ECG changes. 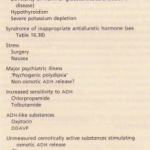 The treatment of adrenal disorders is described. Failure to correct hypokalaemia may be due to concurrent hypomagnesaemia; serum magnesium should be measured and deficiency corrected. Acute self-limiting hyperkalaemia occurs normally after vigorous exercise and is of no pathological significance. Hyperkalaemia in all other situations is due either to increased release from cells or to failure of excretion . The commonest causes are renal impairment and drug interference with potassium excretion. 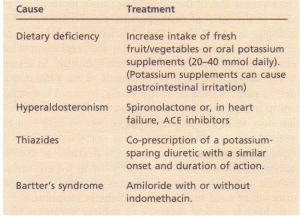 The combination of ACE inhibitors with potassiumsparing diuretics or NSAIDs is particularly dangerous. HYPORENINAEMIC HYPOALDOSTERONISM is also known as type 4 renal tubular acidosis . PSEUDOHYPOALDOSTERONISM is a disease of infancy apparently due to resistance to the action of aldosterone, characterized by hyperkalaemia and evidence of sodium wasting (hyponatraemia, extracellular volume depletion).HYPERKALAEMIC PERIODIC PARALYSIS is precipitated by exercise, and is caused by a genetically determined abnormality of the sodium pump. GORDON’S SYNDROME appears to be a mirror image of Bartter’s syndrome, in which primary renal retention of sodium causes hypertension, volume expansion, low renin/aldosterone, hyperkalaemia and acidosis. The disorder may be due to deficiency of ANP. SUXAMETHONIUM AND OTHER DEPOLARIZING MUSCLE RELAXANTS cause release of potassium from cells. Induction of muscle paralysis during general anaesthesia may result in a rise of plasma potassium of up to 1 mmol litre – I. This is not usually a problem unless there is preexisting hyperkalaemia. 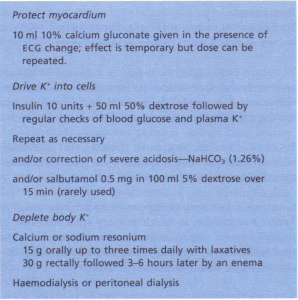 Serum potassium of greater than 7.0 mmol litre-II is a medical emergency and is associated with ECG changes. Severe hyperkalaemia may be asymptomatic and may predispose to sudden death from asystolic cardiac arrest. Muscle weakness is often the only symptom, unless (as is commonly the case) the hyperkalaemia is associated with metabolic acidosis, causing Kussmaul respiration. Hyperkalaemia causes hyperpolarization of cell membranes leading to decreased cardiac excitability, hypotension, bradycardia, and eventual asystole. 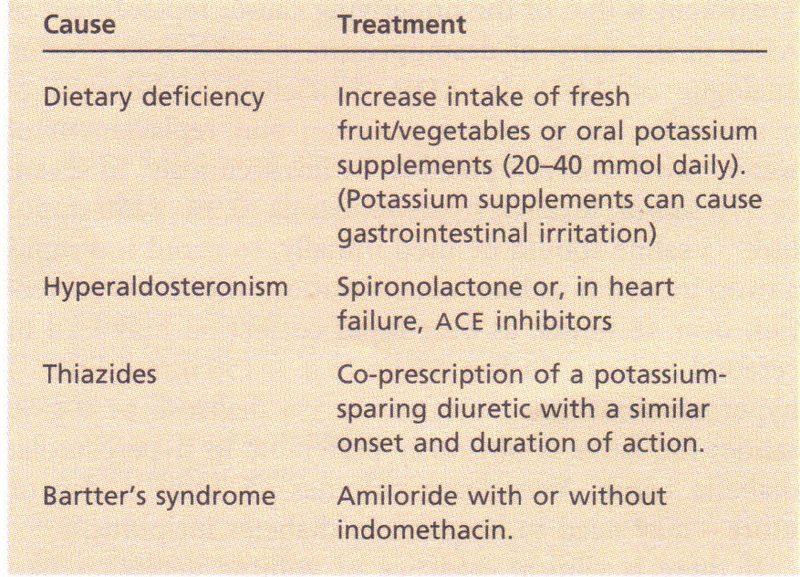 Treatments for hyperkalaemia are summarized in Practical Box 10.1 and should also include treatment of the cause. Calcium ions protect the cell membranes from the effects of hyperkalaemia but do not alter the potassium concentration. Insulin drives potassium into the cell, but must be accompanied by glucose to avoid hypoglycaemia. Regular measurements of blood glucose must be used for at least 6 hours after use of insulin in this situation, and extra glucose must be available for immediate use. Intravenous salbutamol has not yet found widespread acceptance and may cause disturbing muscle tremor at the doses required. 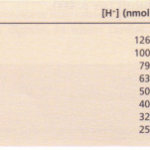 Correction of acidosis with hypertonic (8.4%) sodium bicarbonate causes volume expansion and should be used with extreme caution, particularly in renal failure. Cation exchange resins (sodium and calcium resonium) make use of the ion fluxes which occur in the gut to remove potassium from the body, and are the only way short of dialysis of removing potassium from the body. They may cause sodium (extracellular fluid) overload and hypercalcaemia respectively. In general all of these measures are simply ways of buying time either to correct the underlying disorder or to arrange removal of potassium by dialysis, which is the definitive treatment for hyperkalaemia. All of these measures may cause digoxin toxicity in patients receiving digoxin, in whom cardiac monitoring is essential.